When a patient has shoulder pain and/or dysfunction, it is important to rule out cervical involvement, neurovascular compression (TOS), reduced neurodynamics, fracture, cardiac disorders, arthritis etc. In this 4 part series however, screens for all these will not be included, making this a partial evaluation covering select topics. To evaluate.. to assess, investigate, reason, compare… to apply knowledge of what we know… and combine it with our experience to develop hypotheses. Welcome to the first section of evaluation, here we will cover key concepts applicable to the whole body, especially the shoulder. What structures and/or function is affected? The difference between the symptom, and the cause? What Type, Intensity, Frequency or Time duration (TIFT) is needed in treatment? … These all must be known to deliver the most effective treatment. A good evaluation is essential, but I cannot mention all the importance of an evaluation without its limitations. Know that even the most expertly performed evaluations cannot produce a definitive medical diagnosis. We provide physiotherapeutic diagnoses which collect ‘contributing factors’ to create a clinically based indication for therapy (or a referral). Doctors do the same, they gather contributing factors which they base their treatment/referral on. Radiologists use X-rays, CTs and MRIs to give a radiologic diagnosis. Whether working in a Multi Disciplinary Team or privately, we must keep in mind that all specialists are an inextricable team who although may not be in the same office, work and communicate together to provide the best solution for a patient. We are there to make best use of each others strengths. Whoever has the best equipment or expertise for the suspected problem… they give the diagnosis and treatment. NB: The International Classification of Disease (ICD) and the International Classification of Functioning, disability and health (ICF) were developed by the World Health Organisation (WHO). We work with the ICF model, doctors and radiologists for example work with the ICD model. Although not every country allows direct access to physiotherapy, we should always treat every patient as a direct access. Its very possible a doctor could send you a patient with shoulder pain and ROM restrictions. They could in addition advise you to treat the surrounding shoulder musculature when, as an example, the pain could be referred from the neck. As physios we are responsible to respect the system, as is everyone else. It is important to learn your Red Flags so you know when physiotherapy is and is not indicated. Consider also Yellow Flags and how a patients psychological status can influence their experience of pain, and how this may effect your/their treatment. Of the billions of health problems existing worldwide… physiotherapy can benefit the majority whether in evaluation, treatment, rehabilitation along with all levels of prevention. 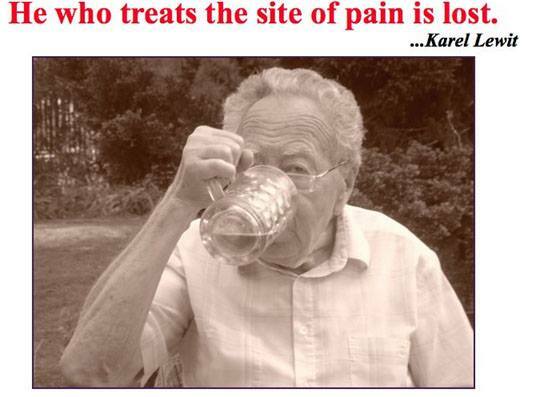 A patient will usually complain of pain, dysfunction or altered sensation. We are required to find out the nature of this complaint, while also taking into account the Irritability and Severity to determine the type of evaluation and treatment we may give. So what concepts of a complaint do we need to consider? Severity – Refers to the intensity of the pain provoking activity. This will indicate the level of caution necessary during the examination and treatment. Irritability – Refers to how easy the pain is to reproduce and how long it takes to subside after the movement has stopped. As you can see… aside from joint mobility, we don’t usually receive ‘Mechanical Complaints’. We receive the Neurogenic Complaints… why is this? When the mechanical issues occur, tissues don’t always react immediately. Most people only notice them after damage, derangement and/or inflammation produce PAIN and/or DYSFUNCTION. A tendonitis or bursitis does not occur after one bump, repetition produces inflammation and sensitisation of the subacromial tissues first. Our bodies are designed with an amazing ability to compensate, antalgic postures are one example of this. Antalgic postures are unconscious body positions, adopted in an attempt to offload painful tissues. Patients may have a shoulder held in slight elevation to avoid upper brachial plexus strain, or maybe to gain extra flexion and avoid impingement pain, or simply to protect it. With this posture their original issue may have been mild pain in their shoulder… however a painful (hypertonic) upper trap or neck muscle could be their main complaint. Compensation involves different muscles taking over to perform tasks. This then tests the involved tissues ability to work in their new biomechanical situation. Sometimes a patient continues complaint free, other times tissue strength, endurance or motor control will lead to functional failure. After your patient has opened your office door, closed it, taken off his/her jacket a certain way, shook your hand, used their arm to position their chair and lower themselves down… all with a particular posture… the anamnesis will be the first important part of your evaluation. However as we have been structure-function focused with my shoulder pages till now, id like to put the anamnesis in another section so we may go straight into a physical evaluation. Do however keep in mind how onset, course of complaints, how a complaints is affected by movement/rest and its 24 hour ‘behavior’ are important and can help reduce the amount of testing necessary! Also the type of pain can tell something about what tissues are involved. Maitland described evaluation and treatment techniques as the ‘brainchild of ingenuity’. In other words: When an individual (brain) has an idea, it is the product (child) of their creativity (ingenuity). But every ‘brainchild of ingenuity’ must come from a level of experience and understanding. When you have these, you can begin to understand how all other techniques were created, and why. With this level of comprehension, no doubt over time you will develop your own way of doing things to suit your body and your patients body type when working. For the shoulder, when I first started learning tests I remember being bombarded when browsing online with testing names which had no meaning. ‘Hawkins Kennedy, the Clunk, Jerk, Apprehension test…’ etc. I found myself unable to remember which names were for which test, without even knowing exactly what they were for or how they worked! I can tell you there are hundreds of evaluation techniques out there, and preferences vary from therapist to therapist. In this section I will not be able to tel you the ‘best test’ for diagnosing any pathology, as unfortunately these do not exist. What we have instead are variations of sensitivity (usually high) and specificity (usually low). With these we are to perfect our technique when performing them, and combining each into a testing battery in the hope that say 3/5 positives will give us an indication of whats wrong. So we will now strip off the names of each test… and look at what is the desired effect in mind behind each. To do this we need to start at the beginning, not the boring the beginning, the interesting RAW fundamentals beginning. As mentioned before, our osteokinematics are governed by the arthrokinematics which occur. These arthrokinematics are themselves governed by our muscles and connective tissues (passive stability). With our muscles being governed by our nervous systems. 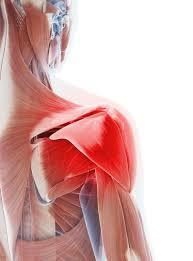 As the shoulder tests we will look at in our next two sections are mostly passive. Lets pay attention to the possible arthrokinematics, or in-joint movements. Thought: If all joints moved with a perfect, balanced articulation… would pathology other than (time and use governed) degeneration occur? Any single or combination of these 4 are used when testing. PMs are naturally occurring articular movements which occur in a healthy individual. They involve roll, slide and rotational articular surface movements. They also abide by the convex concave rule. Labrum / Bursae / Bone. Your aim will be to reproduce the same pain, complaint or dysfunction. So that when it is reproduced, you can consider at that moment, what mechanical stresses are applied to each tissue (remember neuropathies are not covered in this section). By considering these factors you will develop a great understanding which you can use in differential diagnosing. Best of all it will very soon become second nature. In doing all of this you will be testing for range, symptom response, and quality of movement which are intricately linked together. This can be with active movements, or during the search for movement related ‘joint signs’ by passive movement (Maitland 1970). All tests should be used in conjunction with other physical movements identified by the patient that reproduce their shoulder pain. Different patients with different body types may require different grips, positions and techniques. As long as the desired effect is still achieved with regards to tissue movement. We can ask all the right questions and perform all the right tests, but if we are unable to interpret, understand and connect the outcomes of each, we will be unable to apply clinical reasoning and reach a competent hypothesis. Knowing how to interpret, understand and connect the outcomes will improve your clinical reasoning, reduce testing, improve your sensitivity and specificity from your evaluation… and all in all optimise your evaluation/diagnostic accuracy. Now the foundations are covered, next up will be 3 great sections focusing on Shoulder Evaluation. Follow JC Physiotherapy on Facebook and see you next time when we will screen for Subacromial pain syndrome (SAPS).